Live a diferent Mexico, staying in my 2 floors house (300m2) located in the heart of Mexico City just between the historic center (15 mns) and the trendy neighborhood of Polanco (12 mns). Located in a quiet street, it is just 2 blocks from "The Angel of Independencia" the major landmark of the city. 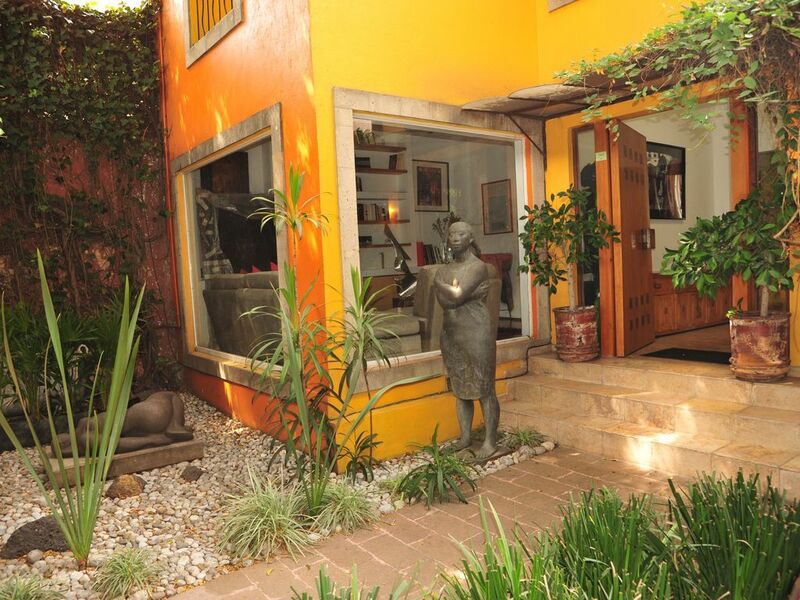 The house with its garden and fountain is an oasis in the middle of the busy city. It has an european style architecture filled with mexican artwork and sculptures, that give a very local spirit. Ground floor has an open kitchen, the dinning room, a piano room and a large living room with direct acces to the garden. First floor has 2 rooms, 1 suite with queen size bed and terrace and 1 bedroom with queen size bed. Both with their own bathroom. Master bedroom is on the 2nd floor and has its own terrace. Wifi available as well as 2 TV with all US channel and some European ones (France-Spain). The neighborhood is very animated with lots of restaurants and main Reforma Avenue is just 10 mns walk. This is the best and original way to visit this vibrant city of Mexico, ranked # 1 travel destination out of 52 cities in the world by the New York Times. I am french, living in Mexico for more than 25 years. Working in the tourism industry I use to travel abroad and want other people to take advantage of this marvelous house. What I like most in this house is that you are in the center of a very busy city and you can feel like beeing in a campside, looking towards the garden, hearing the water form the fountain and the birds singing. Just an Oasis to relax after a long touristic journey. The little house in the garden is rented by a single woman that leave a 8:30am and come back at 9pm. She never use the garden. Patrick's house was perfect. Roomy and well-decorated with a verdant back yard, it was a perfect place to regroup in between activities. It's a short walk from Roma, Condesa, and Polanco and the neighborhood itself is also beautiful. Highly recommended.